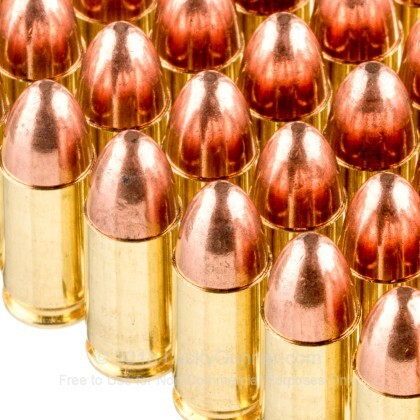 If you are looking for a great round to practice with for self defense, these metal case 9mm rounds are your answer. Invented in 1902, this German made round has swept the world with its effectiveness. Although shunned by the FBI for years after it was blamed for the death of two police officers in a 1986 shootout, they have now declared that, due to the massive improvement over the past few years, the 9mm is now the best round for self defense. Due to its low recoil, damage capacity, and new found effective stopping power, this round is a great choice for all gun owners. 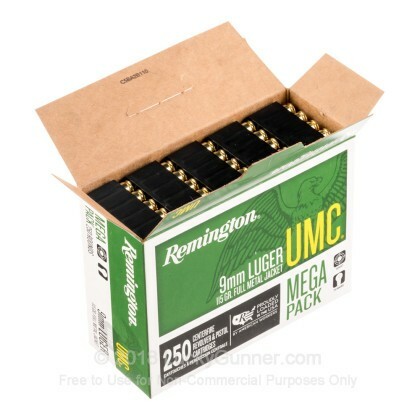 With these high quality, Remington, metal case (full metal jacket) rounds, you have a great range training round. Firing at 1145 feet per second, these 115 grain rounds are sure to perform well for you. By getting 1000 rounds of this reloadable, quality, inexpensive ammo, you are getting all the ammo you need without emptying your wallet. 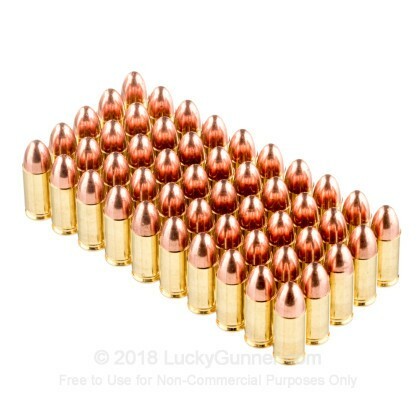 This ammo has served us well at the range. Haven't had any issues with more than 1000 rounds fired through our Glock 19. 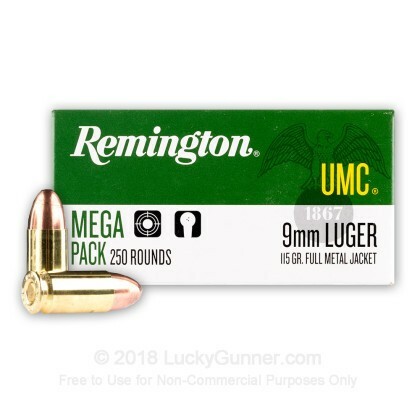 Every time I plan on purchasing 9mm ammo of a different brand, I can't seem to complete the purchase; Remington UCM has won our loyalty with it's fair price and unfaltering performance. 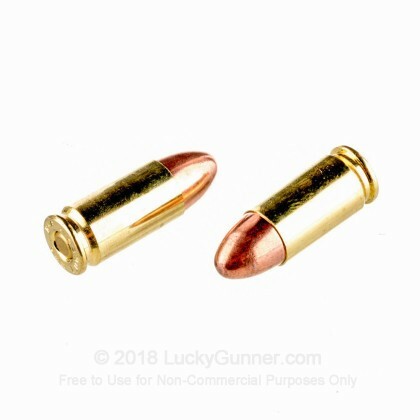 A good quality practice ammo at a reasonable price. This was my first purchase through Lucky Gunner and the experience exceeded my expectations. The process was simple and their post-purchase customer service is exceptional! Placing my order was easy and fast. I received exactly what I ordered in just a week. 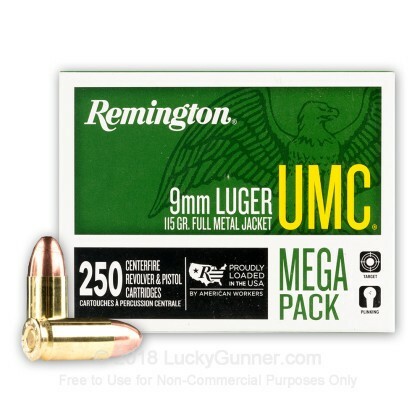 This UMC 9mm ammo performs great, it's clean burning and of the 300 rds fired, no jams or any other problem. Excellant rounds for practice especially for the cost. 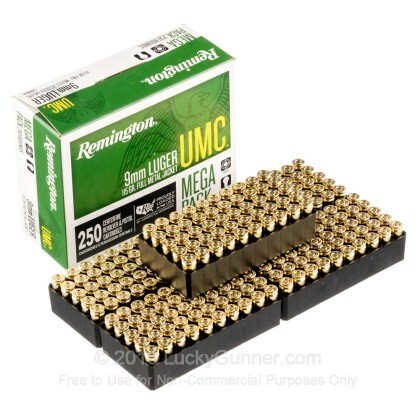 We also have this 9mm - 115 gr MC - Remington UMC - 250 Rounds ammo in stock in a smaller quantity.